Service Distribution Units (SDU) or Service Voids are purpose made stainless steel housings built to enclose the electrical, gas and water supplies required for the cooking appliances. The Service Distribution Units are custom manufactured to suit the cooking appliances and services required. They may also house, if required, the controls for fans, Gas Interlock Systems, Lighting and Fire Suppression Systems. Kitchen Air recommend the integration of Service Distribution Units into our ventilation systems for the safety of staff and hygiene of the complete system. We pre assemble and test all the pipework off-site ensuring the parts are easily accessible for cleaning and servicing. All new commercial kitchen installations that use gas fired appliances must now have a device fitted that prevents the gas from being turned on until the fume extraction system is extracting air (commonly know as a gas interlock system). The British Standard BS 6173 (2009) has been amended to provide users of gas fired catering appliances with protection against the effects of exposure to combustion gases given off when gas is used for cooking. 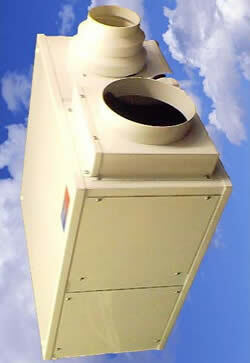 UV-C Odour Control system can be integrated into new and existing ventilation system installations. UV-C Generated Ozone Injection system can be integrated into new and existing ventilation system installations. Electrostatic filtration is mainly used on new installations, Activated Carbon filtration and environmentally friendly chemical masking systems. Individually or combined these are excellent system that saves many hours and countless pounds in maintenance and cleaning bills. UV-C systems for odour and grease control uses special lamps that produce UV-light and ozone. Exposure to intensive UV-light and ozone oxidation causes contaminants in the air to be destroyed, resulting in the reduction of odour emissions to the surroundings with no grease deposits in the ductwork. Fire Suppression Systems are the smart investment to ensure your business is protected. Kitchen Air offer the latest Fire Suppression technology to all of our customers. We can integrate into existing systems or build it into the design of your new kitchen ventilation sytem. 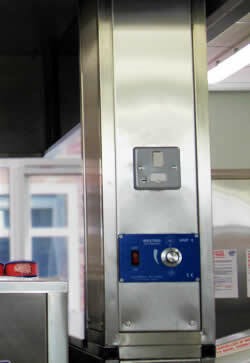 Ensuring your staff, customer and premises are protected against the dangers of kitchen fires. We recommend only the leading fire suppression equipment by Ansul, Ardent and Amerex to meet the exacting specifications of Architects, Restauranteurs, Fire Inspectors and Insurers alike. Our fire suppression systems protects your kitchen 24 hours-a-day, suppressing fires in seconds. When a fire is detected the chemical agent is applied directly into the fire in specific spray patterns. As it smothers the hot cooking greases, a foam blanket is formed, temporarily sealing off combustible vapours to help prevent fire reflash. Our engineers can advise you of the correct deployment of fire suppression technology to meet your specific requirements. 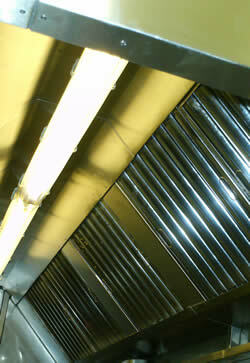 Businesses can not afford to be without essential fire protection, luckily our systems can satisfy the budgets of all. Heat Recovery Ventilation or Heat Exchange technology is an eco-friendly method of re-using heat. The technology, originally from Scandinavia, provides fresh air and improved climate control and also has great energy saving benefits by reducing the heating (or cooling) requirements in the building. Kitchen Air provide a wide range of Heat Recovery Ventilation units that can be sited either in the kitchen ventilation system or the roof space. The unit can be installed within the Service Distribution Unit, in a cupboard or wall mounted. Ductwork connects the stale air exhaust grille to the Heat Recovery Unit and extracts via ducting to all the wet areas of the property. 65-70% of the heat normally lost via trickle vents is recovered as the stale air passes through the cross-flow heat exchanger. Fresh air is brought into the property via a separate external grille, this passes though the heat exchanger and picks up the heat recovered from the stale air. 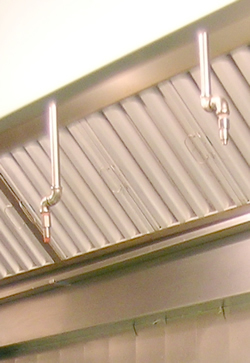 We always recommend a kitchen canopy is positioned directly above the cooking equipment to provide immediate extraction of all fumes and vapours protecting kitchen staff. Our stainless steel extraction kitchen canopies can be manufactured to your exact specification, in line with HVCA DW/172 specification.. Extraction canopies are used to remove all greases and particles in the air. They are then taken through the ductwork and discharged in a safe location. 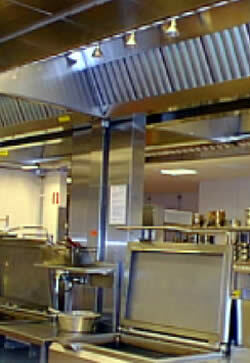 Condense canopies are mainly installed over equipment that produces steam, such as combination ovens, Bain Marie's, pass through dishwashers and sterilising sinks. The basic principle is the same as an extraction canopy but with baffle plates and a drain off point for the condensation. The kitchen canopy will also provide replacement air flow to bring fresh air into the kitchen.